The Himalayan kingdom of Nepal is a landlocked country, bordered by India on three sides and China on the fourth. Tremors of the 7.9 Richter earthquake that hit central Nepal on April 25 shook not only Nepal but also northern India, Bangladesh and Pakistan. 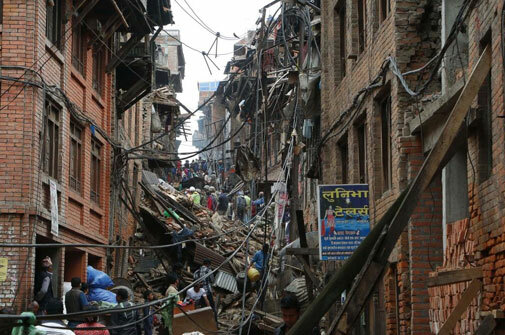 The big Nepal temblor, like the Bhuj quake in India, has once again brought into focus the need to make buildings structurally safe. The Himalayan belt has experienced many quakes in the past century, of which the Assam quake of 1950, with a magnitude of 8.6, was the worst. Among the rich countries, the biggest recent quake was in Kobe, Japan, in 1995. The 7.2 magnitude earthquake proved to be more deadly as it occurred quite close to an urban center. Nearly 7,000 people died and thousands suffered injuries. Though Japan is far more quake-prone than India, the situation is somewhat complex in north India, including the National Capital Region (NCR) which falls in seismic zone 4. Due to the northward movement of the Indian plate which is going under the Eurasian plate at the rate of around 4.5 cm per year, earthquakes are inevitable in the coming years. Therefore, safety measures adopted during the construction of buildings will greatly determine whether they protect lives during an earthquake. The extent of damage caused by an earthquake depends on parameters like intensity, duration and frequency. Topography, soil conditions, building characteristics like form and massing and quality of construction are other parameters to be considered. Factors like density of population, distance of a structure from the epicentre, time of day of the earthquake occurrence and community preparedness for the possibility of such an event are also important. The present building plan approval process in India comprises of three stages to ensure safety standards are met. Firstly, the building designs need to be prepared by a qualified architect who then hires a licensed structural engineer to prepare his design. Further, the design prepared by the structural engineer has to be vetted by engineering experts from the departments of the government. For buildings that are more than 30 metres in height, departments and institutions like the Indian Institute of Technology (IITs) and National Institute of Technology (NIT) have to clear or vet the design submitted by the engineer and architect together. Therefore, it can be said that theoretically buildings in urban India are structurally safe. But the real gaps are at the field level where the construction has to be supervised by licensed architects, engineers and supervisors who are legally responsible for technical work standards and monitoring of overall execution work. They also issue certificates of compliance directly to the authorities. Presently, there is no way to ensure if these engineers are actually monitoring the construction or a developer is constructing a structurally-sound building. This is more so because the onus to certify such claims lies on private engineers and no government mechanism is available to keep a check on them. So, in order to make money, engineers might at times succumb to various acts of corruption (see CSE points out lapses in building regulations in India). An earthquake tests the soundness of building; it exposes strong and weak aspects of its designs, as well as the quality of material used. Given the likelihood of more earthquakes in the Himalayan belt in near future, it is, therefore, essential to introduce earthquake-resistant features in India’s seismic zones by using evolved engineering techniques for construction of buildings. An earthquake-resistant building has four virtues—stable structural configuration, lateral strength, adequate stiffness and good ductility. A building design must ensure that the building has adequate strength, high ductility and will remain as one integral unit, even when subjected to very intense ground motions. Most of the buildings in the country follow only the minimum safety and performance standards that the government has prescribed. Moreover, those constructing single houses often skip engineer plans to save money. The focus has to shift from the cheapest design to the one that is high on performance. To ensure this, government agencies need to push for reinforcement of existing rules and advisories. Today, India has a fairly good range of codes and standards that govern earthquake-resistant designs of structures. These codes are based on the most recent knowledge of behaviour under seismic loading which refers to the application of force equal to an earthquake-generated agitation (but in opposite direction) to a building structure or its model. However, the rules for high-rise buildings (those with more than 30 storeys) are missing. The responsibility for developing national standards for structural loading (the loads that are applied to a structure or its components that cause stress or displacement) and design lies with the Bureau of Indian Standards (BIS). The body is planning to soon release a new code for high-rise buildings. Initially, BIS had set standards for buildings with nine to 10 storeys. But in no way should these standards be used for mid-rise (10-30storeys) and high rise buildings. After witnessing the structural failures during 2001 Gujarat earthquake, the buildings of India were studied by various Indian and foreign agencies. Building standards were then revised. The first formal seismic code in India, namely IS1893 of 1962 was revised in 2002. It now provides design for buildings of 30 storeys and more. The revised 2002 edition, Part 1 of IS1893, contains provisions for general structural safety and those applicable specifically to buildings to prevent them from collapsing and claiming lives during earthquakes. Indian codes are, however, not mandatory, just advisory. The key to ensuring earthquake safety lies in having a robust mechanism that enforces and implements these design code provisions when buildings are under construction. India needs to learn from Japanand take lessons in regulating building construction activity. While the building codes and norms in India focused on preventing collapse, in Japan the goal is to prevent any major damage to the buildings because of the swaying caused by an earthquake. Technologies like base isolation pads and energy dissipation units to dampen the ground’s shaking during an earthquake have also been adopted. It is therefore certain that India has a long way to go if it wants its structures to be safe. Are these building codes available online? Where?